Coffee SavR® keeps coffee fresh tasting for longer than 90 minutes, even when kept on a burner or in a heated dispenser. This unique, patented formulation of approved antioxidants and stabilizers significantly slows down the oxidation and deterioration processes in hot-brewed coffee. Coffee SavR®, which has no discernible taste of its own, can keep coffee fresh tasting for hours after brewing. Its ingredients are 100% safe and meet Food Chemical CODEX and GRAS nutraceutical standards. Coffee SavR® works well with all types of brewing methods, and can be used with any traditional added ingredients that consumers use with coffee, such as: milk, cream, sugar, natural and artificial sweeteners and flavorings. It has no noticeable taste of its own, and does not affect the taste of coffee, with or without added ingredients, except to keep it fresh-tasting longer. It is even effective in freshly brewed iced coffee. 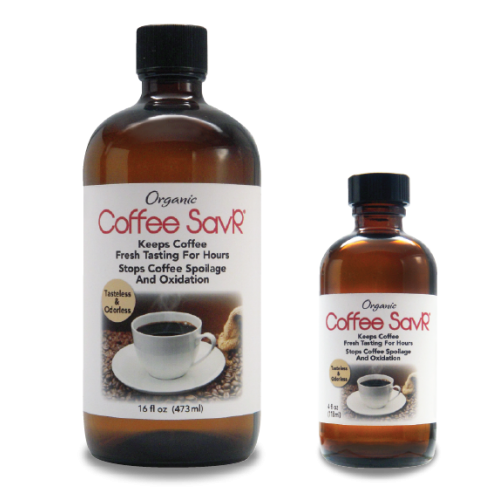 Coffee SavR® is highly cost effective and easy to use. Just 1/4 teaspoon is added to a carafe containing 15 to 20 cups of coffee just before or during brewing. That equates to just one to two drops per 6 – 8 oz. cup. The commercial size pint container is good for over 9,000 cups of coffee. The small size bottle is good for about 2,300 cups of coffee. For just a fraction of a penny per cup, you can have fresh tasting coffee, down to the very last sip, every time.